Unity Study is a performance installation and collaboration between Rebecca Bruno, Lynn Ellen Bathke, Mak Kern, and Ben Ross joined by dancer Samantha Mohr and visual artist Matt Ross. Coming together in weekly sessions, they investigate how objects, sound, bodies, and the spaces they inhabit coalesce to create experience and thereafter, how memories of the experience are physically stored and accessed. The artists collectively explore formal and conversational aspects of their work through live encounter and archive. 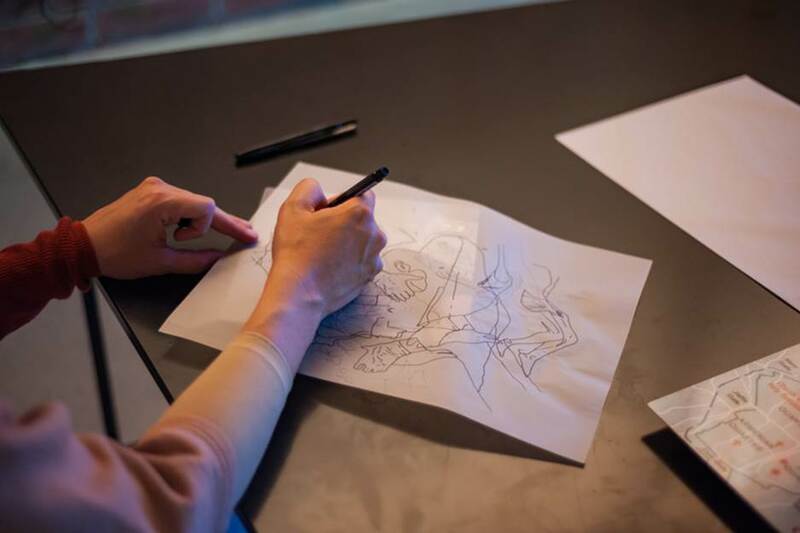 The site becomes a creative laboratory, dance space, drawing studio, artist retreat, and virtual amalgamation of past and present realities, walking the line between intimate private exploration and public presentation with both sensitivity and generosity. During this two month period, an encounter occurs each week as the artists merge their seemingly disparate practices and utilize a variety of materials, sound, sculpture, mark-making, and movement. Recording the evolution of these transitory happenings are traces of dance practice on large sheets of paper, subtle marks describing an embodied experience, a photo series marking time, the chime and percussion of a sound sculpture, and gesture drawings created live during improvisational movement sessions. These actions and their residue are gathered in an online format like a blog, disappearing and reappearing on site each week, captured and reinterpreted in virtual reality, an interactive layer that allows viewers to experience past echoes of the project. Rebecca Bruno is a dance artist based in Los Angeles. Her work addresses our perception of time, space, and relatedness through the body. Bruno received a BA in Dance from the University of California, San Diego in 2008. In 2013 Bruno founded homeLA, a performance project dedicated to dance process in private space presenting works by more than 100 artists in 16 homes throughout Los Angeles. Bruno is a recipient of the WORD Grant, Los Angeles (2016); CHIME (Choreographers in Mentorship Exchange) in Southern California Grant (2015); Annenberg Community Beach House Choreographer in Residence Grant (2015); Prix Marcel Duchamp, associate choreographer for Julien Prévieux (2014); Kendall Laurel Liu Dance Award, San Diego, CA (2008); and Stewart Prize in Choreography, San Diego, CA (2005). Her work has been presented nationally and internationally at venues including Honor Fraser Gallery, REDCAT Theater, Norton Simon Museum, Annenberg Community Beach House, Sushi San Diego, Movement Research, NYC, and The LAB, Jerusalem, Israel. 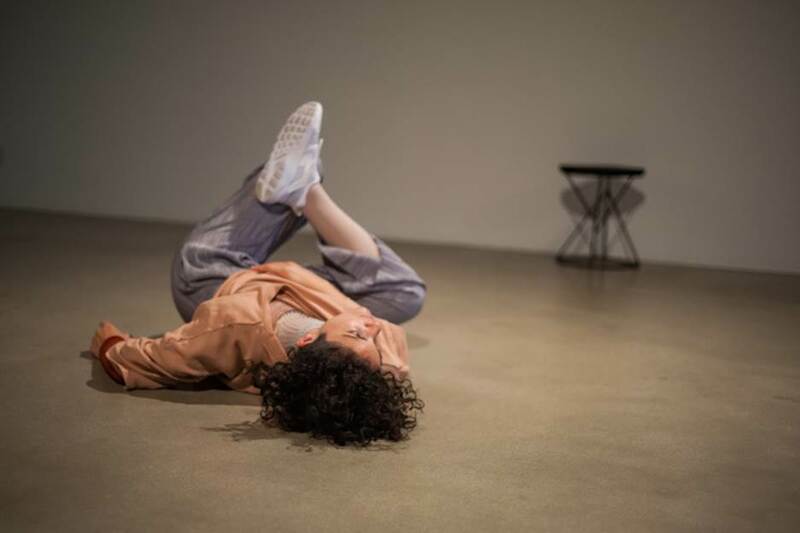 Rebecca has worked as a dancer and collaborator with many choreographers and visual artists including taisha paggett, Pablo Bronstein, Julien Prévieux, and Flora Wiegmann. Lynn Ellen Bathke is a designer, shoemaker, and textile conservator based in Los Angeles, CA. She received her BFA from the School of the Art Institute of Chicago in 2006, and her MA in Art Conservation from the Textile Conservation Center in the UK in 2009. Lynn’s conservation projects have ranged from Taiwan’s beloved Formosa Republic Flag to some of Hollywood’s most iconic costumes. She has worked with museum costume and textile collections through-out Los Angeles, including LACMA, FIDM, and The Academy Museum of Motion Picture Arts and Sciences. Her artisan design label, BATHKE, was established in 2013. Lynn currently teaches at LACHSA. We exist in Time an Everything is Impermanent. Design is a Process, an Action, and not a Product. Objects are Ideas that have taken Shape. These objects change as our ideas change. They Reflect back to us our own image. Design is a lived experience and objects live within our experience of them. Beauty as a dialogue, a dynamic, a push pull relationship between different aspirations seeking balance, connection, and meaning. If I define beauty as less than this- as an aesthetic- I am left with only rules and agreed upon standards that can only limit our possibilities. I make Objects to create Experiences. BFA, N.Y.S College of Ceramics and Art and Design, 1991. Samantha Mohr received a BA in World Arts and Cultures/Dance.from the University of California, Los Angeles in 2012. She has performed nationally and internationally with Elizabeth Leister, Victoria Marks, Lionel Popkin, Julien Prévieux and David Roussève. Matt Ross is a musician and visual/performance artist based in Portland and Los Angeles. His most recent works include collaborations with the Institute of Contemporary Art Los Angeles, homeLA, and Oculus. Matt is a co-founder of Co.Reality, an immersive art / storytelling collective, whose work can be seen at Sundance 2017. He studied theatre at Lewis & Clark College with a concentration in performance. Matt's upcoming projects focus on separating time from space and finding the creative crossroads between art and social justice.